We know some payment processors charge a small fee when making a deposit. That's not fair for you, right? Well, now we'll be covering those annoying fees! Every time you make a deposit you just need to click on the We pay your fees Box. 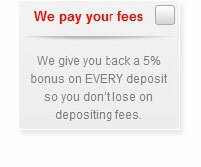 A 5% bonus will be credited automatically when your deposit is completed. - At any time we reserve the right to ask for a statement or receipt to corroborate the fee. - The fees covered have to be strictly related to the deposit made by the player. - The 5% fee amount will be credited in your Bonus account. The cash back bonus will be automatically credited as long as you don't have payouts requested or approved during the week. That's all you need to qualify for it! - All T&C apply to the bonus. - Players with 75% ratio or more do not qualify for the offer. - Once received the cash back bonus will expire after 6 days. - Players with pending or approved payouts within the last 7 days won't receive the cash back bonus.